1.) Mix 1/4 cup oat flour, 1 tablespoon coconut flour, 1 teaspoon baking powder, 10 drops lemon liquid stevia, 1/2 juice of a lemon, 1 egg white, 2 tablespoons plain greek yogurt, 2 tablespoons unsweetened almond milk! 2.) Spray a mug and transfer batter to mug. 3.) Press in about half of the 1/3 cup blueberries down into batter. 5.) 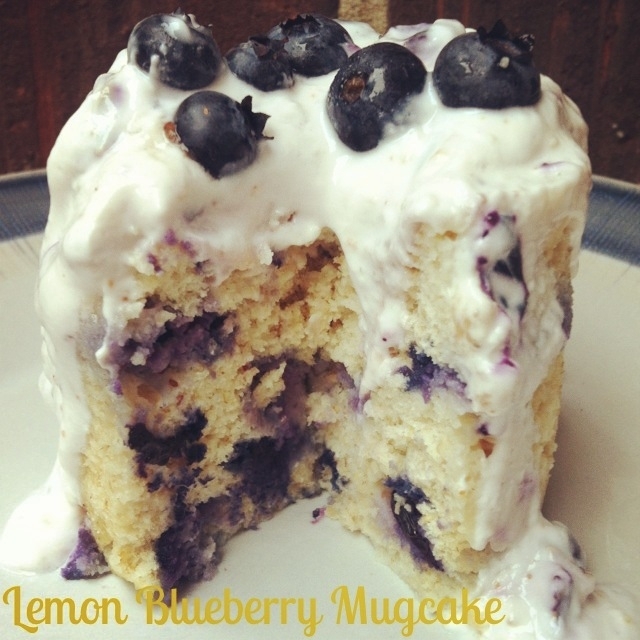 Mix 2 tablespoons plain greek yogurt, 1 packet stevia, and a few blueberries. Mash the blueberries into greek yogurt.